A snapshot of the Mboka Festival 2019. A snapshot of the Mboka Festival of Arts, Culture and Sport that took place in The Gambia from January 21 – 27, 2019. The third edition of the Mboka Festival of Arts, Culture and Sport that has been happening in The Gambia since 2017 was on in the first month of this year from January 4-27. The literary section of the month-long cultural extravaganza, organised by the Sable Litfest, would happen from January 21 – 27. Mboka Festival 2019 opening night. This year the Mboka Festival started with a gathering of local and international writers on the grounds of Coco Ocean, one of the top hotels in The Gambia on January 21. With its ocean backdrop, the event would feature performances of the kora, readings and lots more. It was a beautiful start to the week that had workshops for schools and the University of Gambia during the day and events for adults at different locations in the evenings. 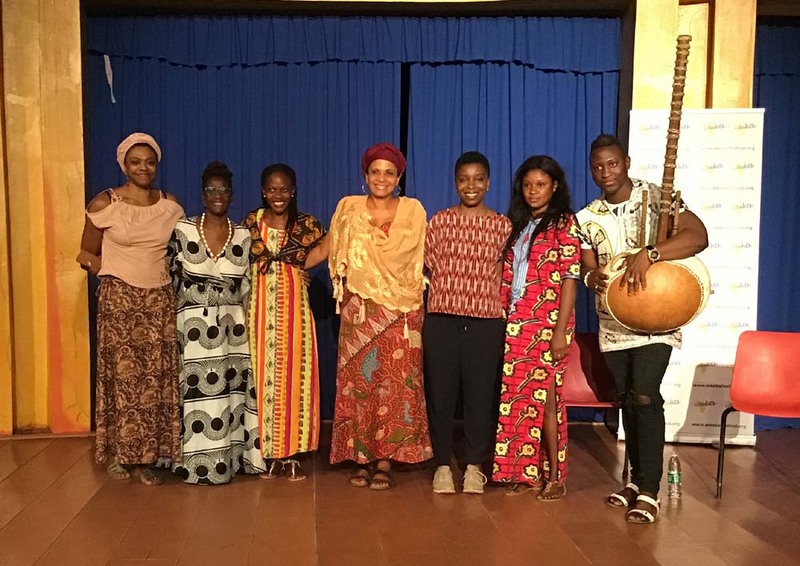 Anni Domingo and John Titi worked together to deliver workshops for students at the University of The Gambia and at schools in Storytelling and Shakespeare. Yvonne Mbanfo also created a linguistic workshop between Igbo and Wolof which are both in the Niger-Congo family of languages. The Mboka Festival would do a series of events as part of the popup Igbo Conference that should be happening in full in London in April. One of these was a film screening and panel discussion with Nigerian filmmaker Oba Kosi Nwoba whose documentary Iko Ndụ: The Palm Wine Story resonated with The Gambian audience. There were also the screenings of Joy, It’s Nina by Joy Elias-Rilwan and Jane Thornton as well as Gifts From Babylon by Bas Ackermann, Emiel Martens & Babaucarr Manka. This screening followed a panel discussion led by Alieu ‘Mortal X’ Bah, Decolonising Conversations: Africa and Her Diaspora. In what is becoming an annual event, literary ancestors would be honoured with readings from their work alongside poetry and songs inspired by them on Tuesday, January 22. This year the focus at the African Poetry Library @ NCAC, Fajara was on Dr Lenrie Peters, Ntozake Shange, and Maya Angelou. Anni Domingo’s Krio version of And Still I Rise (I Go Grap) thrilled the crowd in one performance. Dr Cherno Omar Barry read from his new book on Dr Lenrie Peters, widely considered to be the father of Gambian literature, published by Global Hands. The evening ended with the reminder that our ancestors left us the gift of storytelling and Kenyan John Titi delivered that! On Saturday March 26, the session called ‘African Women and Creativity’ that featured local and international women of different genres would take centre stage. The afternoon started with Awara’s workshop and play reading Birthing a Woman. This would be followed by a showcase of women’s talent featuring Zena Edwards, Noo Saro-Wiwa, Patricia Foster, and Mamle Kabu. Translating Ama Ata Aidoo’s Our Sister Killjoy. Although Ama Ata Aidoo, initially scheduled to be the festival headliner, couldn’t attend in person the team continues the translation project on her iconic novel Our Sister Killjoy with her permission. At the heart of this work, instigated by first headliner Ngũgĩ Wa Thiong’o, is the translation of the guest writer’s work into Gambian languages. Gambian Association of Writers revival. The presence of the literary festival is helping to revive The Gambian Association of Writers (WAG) led by writer and politician, Dr Cherno Omar Barry, who supports the festival by attending and participating in events throughout the week. The first event of the newly revived WAG will be on 27 April, the birthdate of Dr Lenrie Peters. What is truly wonderful about Mboka is the vibe that permeates during and post-festival. This year, the gathering spot was on the balcony of programmer Akila Richards and Mboka doyen Anni Domingo, until the early hours, sharing stories, jokes, activities of the day, best local restaurants to eat and breakfast at Sally’s 24-hour café and at Jarama’s to play Wuri (Oware). The festival ended with an open mic at the closing party at Mymoonia Gardens, a Caribbean Gambian restaurant with DJ Musufing. The next Mboka Festival will be January 2021 as the even years will now be a Pan African conference in May, which will include a literary component. The call for papers for the conference will be available from April 2019. All the images in this post are courtesy of the team at Mboka Festival including Kadija George and Monika Akila Richards. Here are a few more of the sights from the festival. Previous Previous post: Kwame Dawes is Windham-Campbell Prize 2019 recipient. Next Next post: Bensalem Himmich, Dr Abderrezak Belagrouz are Sheikh Zayed Book Award 2019 winners.